So 2015 saw two big firsts for me. I adopted my first dog (the new star of my personal Instagram as well as his own.) 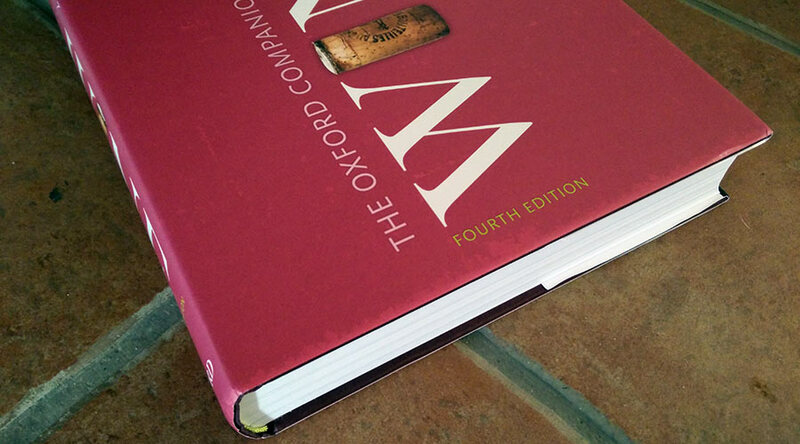 The second was that I bought my first copy of the Oxford Companion to Wine or OCW. I’ve had various other books by Jancis Robinson in the past but I arrived at a point in wine-ness that I thought it a decent book to have. Of course the tilt that this massive tome has lent my desk can only be offset by putting weighty bottles on the other side to balance it out. Suffice to say, this is a tremendous book but it states this in the most downplayed of British ways by being merely a “companion” to wine. There is nothing Biblical or Definitive or anything else so grandiose to its title as one may find in North American wine books of this nature. It is meant to sit there by your side and if you find yourself drinking Altesse, you can easily open up this book and learn more about this grape as well as the region it resides in. That’s all fine of course but you’ll soon find yourself reading about Japanese wine or other topics like all these damnable French wine terms we use in English that I can never remember. For someone deeply immersed in wine, this is a crucial book to have and I’ve cherished it a great deal. Andrew Jefford had a bit more criticism for it though. This mainly revolved around how brief some of the articles were. It is true to some regard, but with the overall size of the OCW, it’s extremely difficult to really flesh these out anymore and when it comes to the grape varieties, it’s obvious that the reader should consider picking up that equally massive tome, Wine Grapes, if that’s their main focus. Jefford admits this as well and his is but a minor quibble in an otherwise tremendous work. I too have my very small nitpicks such as the sections on Catalonia seeming to be carried over from the previous edition with little or no revision which was a surprise given that Jancis has the very qualified and knowledgeable Ferran Centelles from Catalonia on staff. Most of the entries for the region still appeared to have been penned by Victor de la Serna. Again, like Jefford, I have to stand back and look at this Catalonia section in context of this book and the greater wine world. Catalonia has indeed changed a great deal since 2006 but did it warrant a full revision? I want to say yes, but in terms of revising a book of this magnitude I can easily see how it stayed similar enough to carry on as it was and honestly, anyone reading these sections will know the base material needed. This comes in to a much larger point about the OCW that occurred to me both while using it as a reference and then with Jefford’s column which is that this could very well be the last printed version of this book. Jancis wrote the first edition of this book in 1994. As she mentions in this great post about the history of the OCW, it was a very, very different time and most importantly, there was no internet like there is now. That has changed the context of a book like this massively and as such, you can find the entire edition online at her website for paying members. It lacks that satisfying sound of the turning page and the sense of discover found in paper, but it’s extremely easy to access all the reference material quickly and directly. In the 21 years between the publication of the first edition and this fourth edition, it goes without saying that the wine world has changed a great deal. Entirely new regions have popped up on the wine map during this time. And while Jancis and Julia Harding both have wide and vast knowledge of this changing landscape, it makes me wonder if it’s simply impossible to capture all of it in just one book while balancing out some level of depth to each entry along with it not needing a dedicated handtruck to move it around? When looking at some entries, I would then use key terms to look up additional information online to fully flesh-out a subject as again, 850 pages isn’t enough space to hold the collective wine knowledge of the world these days. That’s pretty cool when you think about it although probably nerve-wrecking if a Master of Wine or Master Sommelier student. I suppose the next few years will be telling although it seems that given the popularity of jancisrobinson.com, doing some form of regular updates and announcing them to the members could potentially be of more use than a reference book published every few years. It’s a somewhat similar issue as to how Jancis publishes her columns from the Financial Times in full on her site as the paper just doesn’t have the space to put in all the text. Again, I do enjoy my paper copy of the OCW but I also enjoy my digital copy of Wine Grapes that allows for easy searching so maybe paper and digital will both coexist for some time to come.